Ten years ago, a ship has embarked on a voyage. meaningful life with good causes on its compass. Sailors of the Ocean discovered the joys of gratitude rather than regret. They discovered that one’s soul gets richer by giving rather than taking. They saw how a tiny rock thrown into the Ocean creates a ripple effect. 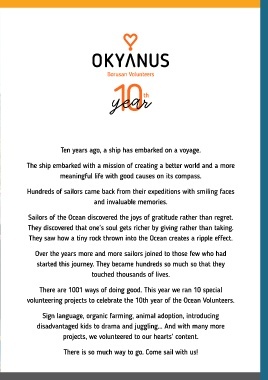 volunteering projects to celebrate the 10th year of the Ocean Volunteers. projects, we volunteered to our hearts’ content. There is so much way to go. Come sail with us!